Negotiation is a critical skill needed for effective management. "Negotiation: Readings, Exercises, and Cases, 5/e" takes an experiential approach and explores the major concepts and theories of the psychology of bargaining and negotiation, and the dynamics of interpersonal and inter-group conflict and its resolution. It is relevant to a broad spectrum of management students, not only human resource management or industrial relations candidates. It contains approximately 50 readings, 32 exercises, 9 cases and 5 questionnaires. Roy J. Lewicki is the Dean's Distinguished Teaching Professor at the Max M. Fisher College of Business, The Ohio State University. He has authored or edited 24 books, as well as numerous research articles. Professor Lewicki received the first David Bradford Outstanding Educator award from the Organizational Behavior Teaching Society for his contributions to the field of teaching in negotiation and dispute resolution. He has won several teaching awards at Ohio State, and held visiting faculty positions at Dartmouth College and Georgetown University. David M. Saunders is Dean of the Faculty of Management at the University of Calgary in Calgary, Canada. He has co-authored several books and articles on negotiation, conflict resolution, employee voice and organizational justice. He is also the winner of a distinguished teacher award and co-developed the McGill Negotiation Simulator, a computer-based interactive video simulation of negotiation. Prior to his current appointment, David was Director of the McGill MBA Japan program in Tokyo, and he has traveled extensively throughout Asia and Europe. He and his wife Susan are the proud parents of Basil, a very active Wheaton Terrier puppy. 1. 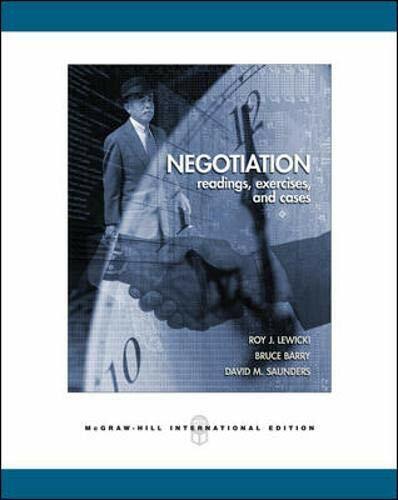 Negotiation : Readings, Exercise and Cas, 5th ed. Lewicki, Roy J.; Barry, Bruce; Saunders, David M.